Soon after talk about local helped those at Marches Access Point create The Kington Blackboard in August 2009, the community website very quickly started looking ahead to the festive season, discussing the issue of Christmas lights. 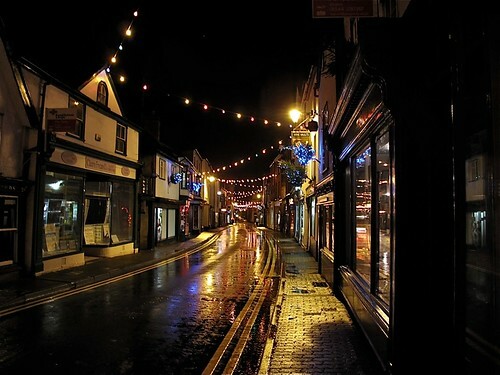 Although the online poll vote was overwhelmingly for lights for the small Herefordshire town, it seemed the money for them was not forthcoming, and it looked to be a dark, bleak winter for Kington. People rallied around the issue on The Kington Blackboard, voicing their support and, in The Chamber of Trade’s case, putting their money where there mouth is and providing £500 towards the lights. talk about local, being avid readers of the site, could not fail to be moved by Kington’s plight and matched The Chamber of Trade’s support, giving £500 in support of the cause. This meant that, on 30th November, the lights were put up in Kington and switched on to much rejoicing during the lively Kington Christmas Fair on 5th December. Unfortunately, they were switched off shortly afterwards after doubts were raised about their safety but these issues have thankfully been resolved and Kington now has its lights on just in time for Christmas, meaning Santa can land there safely. Would this have happened without The Kington Blackboard? It may very well have, but there’s no doubt the community having the online space to discuss and rally support around the problem certainly helped to solve it. 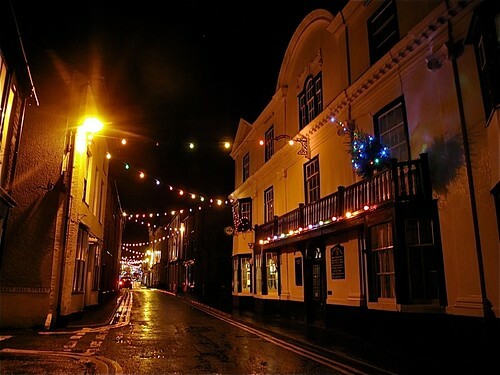 I went along to the Christmas Fair and lights switch-on, so I’m leaving you with a couple of photos of a festive-looking Kington – here’s the happiness a local website can help to make happen!